Canabalt ushers in the return of the Friday Fun ‘n’ Games to this webspace. 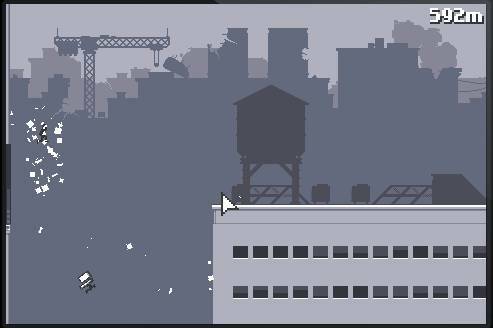 You are a low-resolution animated figure who bursts out of his high rise office building to begin a dramatic escape. An escape from what? You pick: overbearing boss, zombies1, your least favorite co-worker who’s desk the fates have placed not three feet from yours2, or perhaps just regular old office boredom. Point is, you must flee. And doing so is as simple as clicking your mouse to hurdle obstacles, avoid bombs3 and jump – like superman – tall buildings. As simple as it is addictive, the only goal is to run as far and as fast as you can until your attempt at flight inevitably comes up short. Yes, the only victories here are moral victories for there is no real escape. The zombies will win, your co-worker is inching her desk ever closer and the mind-numbing doldrums of your workplace will inevitably crush you. Except for the few moments per day when you seek respite in such leisure escapism as Canabalt4. You’ve been warned. Yeah Friday Fun ‘n’ Games! “You are a low-resolution animated figure who bursts out of his high rise office building to begin a dramatic escape.” This should begin your novel (or at least short story).